Terry Appleby, former general manager at the Hanover Consumer Cooperative Society, checks out his groceries with On Shin, of Grafton, N.H. at the Co-op Food Stores location in Hanover, N.H., on Jan. 8, 2019. On Shin, who has been an employee for over twelve years, said, "I've never had management so wonderful." (Valley News - Joseph Ressler) Copyright Valley News. May not be reprinted or used online without permission. Send requests to permission@vnews.com. Terry Appleby, former general manager at the Hanover Consumer Cooperative Society, poses for a portrait in the offices of the Co-op Food Stores location in Hanover, N.H., on Jan. 8, 2019. Appleby retired from the position at the end of 2016. (Valley News - Joseph Ressler) Copyright Valley News. May not be reprinted or used online without permission. Send requests to permission@vnews.com. 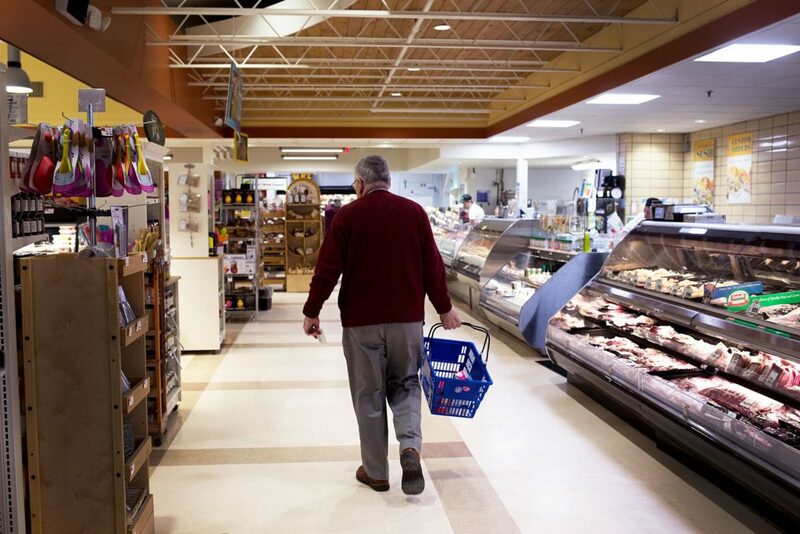 Terry Appleby, former general manager at the Hanover Consumer Cooperative Society, shops for the night's dinner at the Co-op Food Stores location in Hanover, N.H., on Jan. 8, 2019. Appleby retired from the position at the end of 2016. (Valley News - Joseph Ressler) Copyright Valley News. May not be reprinted or used online without permission. Send requests to permission@vnews.com. Most people in The Upper Valley have visited the Hanover Consumer Cooperative Society at one point or another. With locations in Hanover, Lebanon and White River Junction, as well as auto service centers in Hanover and Norwich, the Hanover Co-op Food Stores does about 5,000 customer transactions each day, totaling around $72 million annually. For decades, the man behind that force was Terry Appleby, the co-op’s general manager from 1992 until his retirement in 2016. 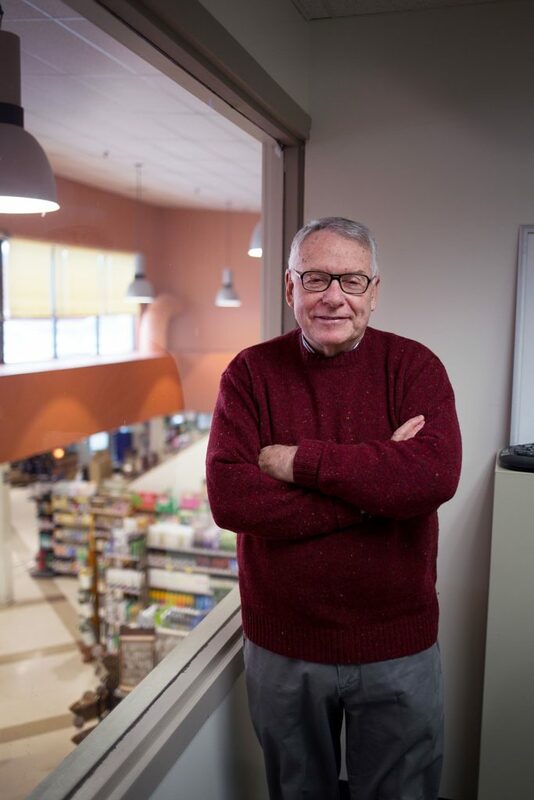 Appleby, who is 70, helped guide the co-op’s expansion while also supporting the growth of other cooperative operations throughout New England and even internationally. This spring, Appleby will be recognized by the National Cooperative Business Association when he is inducted into the Cooperative Hall of Fame. Allan Reetz, the director of public relations for the Hanover Co-op Food Stores, helped nominate Appleby, and said he was surprised by the rigorous selection process. In addition to outlining Appleby’s leadership of the Hanover Co-op, Reetz detailed the ways that Appleby supported co-ops as in far away as Ecuador, where Appleby helped early efforts to bring fair-trade coffee to market. Although this work did nothing for the bottom line in Hanover, Appleby felt that the co-op movement globally would be stronger when people worked together. “That’s the path Terry showed all of us, on a national level, on an international level, and on a local level,” Reetz said. A co-op is governed by member-owners, who can vote for and serve on the board of directors. 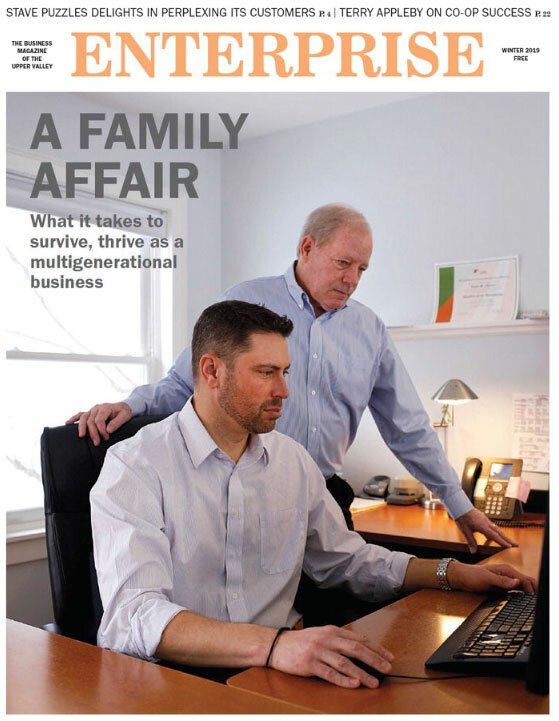 How is managing a co-op different from managing a traditional business? Appleby: As a co-op, we’re guided by seven principals, including democratic participation and community good. The element of profitability is something we have to be aware of, but it isn’t the overriding concern in every decision that we make. We also have to think of the environment, service to our members and community needs. The Hanover Co-op has won awards for its relationship with farmers, including the implementation of an annual meeting where the co-op and the farms it works with come together to discuss any issues. Yet, when you came in the ‘90s, the relationship was very different. How did you change the dynamic? In the ‘90s, there was a lot of mistrust among our vendors. There was an antagonism toward farmers and other local vendors, and I saw that as destructive. The first step to correcting it was to decide to have a better relationship. Secondly, there was a realization that a competitive relationship between the co-op and our venders was lose-lose. I opened up a dialogue right away. We decided to appoint primary suppliers for certain products. Rather than everyone growing broccoli and no one making money on the deal, we designated a supplier that we were going to purchase from and a backup supplier. We started working with the farmers and they started working together as well. Because they knew they had a market where they were going to be able to sell their products, they started to invest in their operations and build greenhouses, so their growing season started to expand. It was win-win-win: the co-op won, the farmers won and the consumers won. You once got a feedback from a customer who was frustrated with the pricing at the co-op. Can you tell us about that? The member said, “What am doing? Putting the farmer’s kid through college?” I thought, “Yes, that’s exactly what you’re supposed to do.” I pointed out that this is what we’re trying to do: make a system where everybody can make a living. You’re not going to have an agricultural system in your region if you don’t support the farmers. Is that an idea that you also wanted to extend to the 370 people who work for the co-op? We felt it was a good business decision for us to be a place where people wanted to work and felt valued. 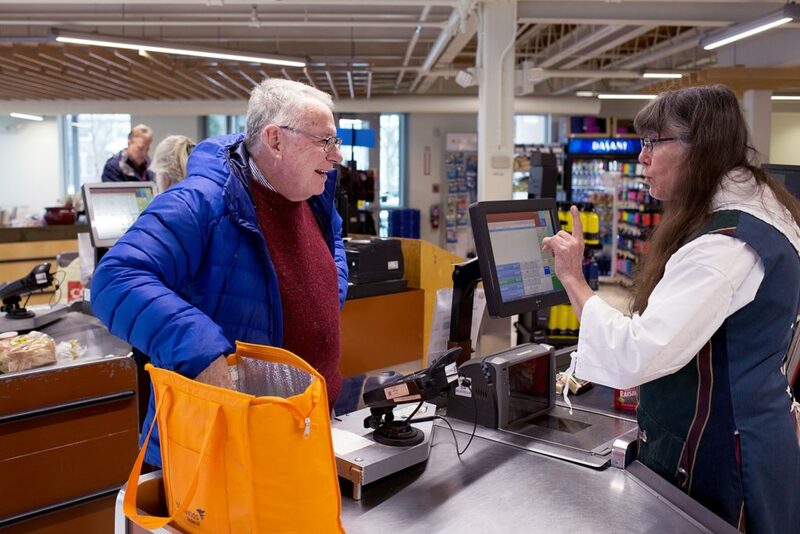 Most grocery stores have 70 percent part-time employees, but 80 percent of our employees are full time with access to benefits once they work 30 hours a week. That’s part of our mission and our philosophy. The reality is the grocery industry is a pretty low-paying industry and pretty competitive. We operate on a 1 percent margin or less. The biggest cost of operation is labor. It’s a constant struggle to be a place that people want to work, to give benefits that allow our employees to make a little money, send their kids to college, buy houses and cars — all those things that we want people to do to strengthen the society — amid a very, very tough economic situation. It’s a great balancing act, but our principals have held up over the years. People typically are not going to get rich working in a grocery store, but we give people a boost up. In addition to your management of the Hanover Co-op Food Stores, you served on boards of many organizations in the co-operative industry, and shared time and resources to help other operations like the Littleton Co-Op get started. What made you such a successful leader within the movement? Everywhere along the way, I had mentors and colleagues that taught me things about cooperation, management and interpersonal relationships. I was taken under the wing of people who were willing to be generous with their time and knowledge. Then, the board allowed me a lot of latitude during my career to expand the reach of the Hanover Co-op to other cooperative entities, sharing our time and resources. By definition, a co-op is a place that takes more than one person to be successful. You have to have a lot of people working together.